The "Vesterålen" was permitted to sail again in the evening of Jan 8 after trials were carried out with representatives of Veritas. The ship departed from Bergen northbound at 10.30 p.m. with around 100 passengers on board. The ship was headed to Ålesund where it some cosmetic repairs to the bow will be carried out before the ship continues its northbound track. 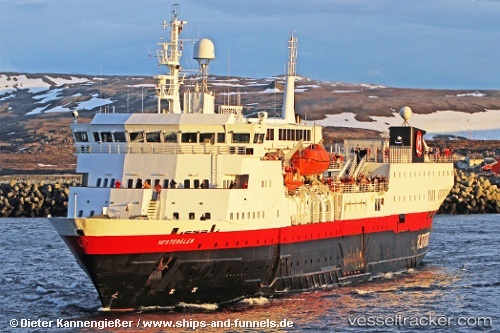 Two people were saved by the "Vesterålen" which was underway to Tromsø on Sep 4, 2012, at 9.30 p.m. The ferry was notified by the Rescue Coordination Centre of Northern Norway about two people in need of help after their 25-foot fishing boat had begun taking on water. Both now were in a rubber boat in the outer reaches of the Lyngen Fjord, drifting in heavy sea. Both were safely picked up by the ferry and were in good condition. The lifeboat "Ulabrand" and the coastguard vessel "Farm" also attended. The f/v was blown onto rocks.